Mordsith's post on Casper inspired me to find these photos. These photos were taken on New Year's Eve in Hawaii. Hawaii's love for fireworks is a nightmare to my dog, Basset. 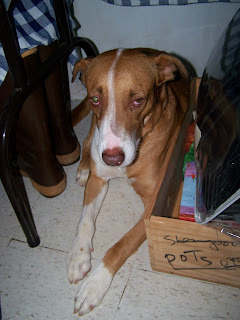 Whenever a loud bang would go off, she starts cowering, crying, and trying to find any corner or room to hide. On this instance, underneath the table. 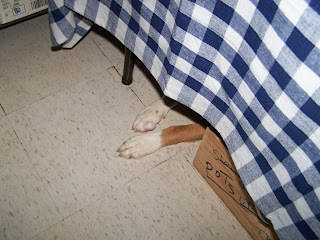 There you can see just her front paws sticking out of the table cloth. Even the most delicious smell of barbecue couldn't coax her out of her hiding place. I lifted the table cover and took this photo of her. She gave me this tired, sad face. I really think she was annoyed I was taking photos of her most embarrassing moment. I was laughing when I took this photo. This is how she spent the rest of New Year's Eve. I made sure she was calm the rest of the night, and I think she did understood the fireworks were just for one night. This is Basset when she's calm and composed , and she's giving me the "what you doing" look. Basset is a mixed Hungarian Vizsla, and she's now 7 years old. Basset's Mom, Snappy, was found by my Dad at an old sugar cane plantation in Ewa Beach. She was still a puppy at that time. My Dad was surprised to find a lone puppy wandering the area, and he decided to take her home. My parents wanted to take her to the animal shelter as it was expensive to keep a dog, but I insisted we keep her. I actually hid Snappy and didn't let her out of my sight. I think that, that was one of the best decisions we made. 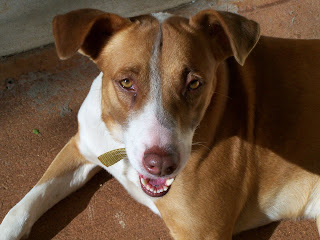 Snappy gave us unending friendship and loyalty. She gave me the time of my life. A careless accident took Snappy away from us in 2000. But great dogs like her are never forgotten. Yes, great dogs are always remembered. why is she hiding, kayni? 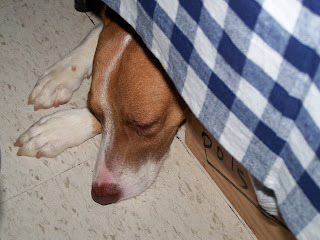 Our dogs are like Basset during the New Year, they all cower and were looking for cover! Hi Basset! Mordsith, I agree. I don't remember ever having a bad memory with my dogs. Angeli, She's afraid of firecrackers. Cher, Me too. I miss Basset since she lives with my parents in Hawaii. Sheng, I think it's common for dogs to be afraid of fireworks. Toni, I agree. They give us so much. Lailaa, Yes, pets don't deserved to be cooped in houses. This is one reason why Basset is better off living at my parents place where she can run and enjoy the beach. I envy her. for a while there, i thought you meant a basset hound :). if she's brown all over, she'd be the right color for a viszla. Onyxx, Yes, Basset's mom was pure Viszla. We don't know who's Basset's dad is or what kind of breed he was. It was interesting to see Basset with all the white fur compared to her mom. indeed, dogs are a million times more sensitive than humans in terms of sound and smell. our dogs in the province reacted the same (with Basset's) last new year. loud sounds & firecrackers just scare them that they do not know where to hide themselves. Fren, You said it so well. Daphne, It was my cousin's idea to name her Basset. She couldn't pronounce "Bassit" which means little in Ilocano. So we all started calling the dog "Basset" as my cousin pronounced it. my parents' house gets crowded with our dogs every new year fireworks celebration too, it's funny and cute at the same time. your dog is very pretty! Miss Firefly, Thank you. I bet you miss your dogs back home =). I dont have a dog but when I was a kid we had a pup, we called him muhaw, I miss having a dog. Wish we could get one, husband promise that he will get one from his mom. i love bigger dogs talaga. we have a dog named Frodo..very cute when little but after only a year, he grew up so big that he can push you down to the ground.but he's so loving and loyal..
ang gaganda ng names nila. casper, basset.. ours was named blackie, brownie, and the last one, tootsie. (we're so creative, yeah? hehehe.) i was in 3rd year hs when tootsie passed away. :-( that was a long time ago. tanda na ako e. hehehe. A lovely name. I had three dogs at different times and they were all named Pochi. And they're all spitz. The last one was my most favorite and he oddly died for being allegedly fed by MSG by one of our neighbors. I can feel how tired and sad she was that night thru the photo. Poor Basset! eks, maganda naman ang tootsie =). wits, my dad has the same practice. we once had a dog named Simba, and he wants to name all our dogs Simba. I also have a dog his name Whity. Sad to say he died. I like taking care of dogs. I miss my dog.